Sibusiso Duma is a young artist who is presently making his mark within the Durban art scene. His talent was noticed and nourished by the late Trevor Makhoba (qv.) through his Philange Art Project based in Umlazi, a township south of Durban where Makhoba had built a studio space behind his house. For four years Duma was under Makhoba’s tutelage, and has since shared a stage with Makhoba and another former student, Welcome Danca. Together they have held a number of exhibitions at the African Art Centre in Durban. 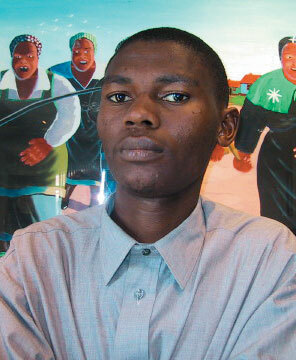 Although Duma has built on his own style and visual language, the influence of Makhoba is noticeable. This does more credit than harm, and his work is able to stand on its own as work with an original eye. His treatment of surface, subject, space and colour is unique in that other issues are not stated directly but are alluded to, thus creating an element of intrigue and wonder. Duma’s sense is gentler and his subject bolder and less intricate. The strong social commentary with a touch of humour as seen in the painting The ghost (plate 323) shows the ‘homecoming’ of a deceased man, depicted as a skeleton with a suitcase symbolising a journey taken; he also has a hat and a traditional stick suggesting his social standing at home and beyond. Two women are seen moving hastily away, as if fleeing from the ghost in the foreground. This foregrounding emphasises the meaning of a man in the home. It is always believed that the spirit of the deceased should be brought back to protect the family. However, a ghost may symbolise bad blood and that the departed has not gone to rest because of some unfinished business; or perhaps a certain ritual has not been carried through. This ‘bad blood’ could also allude to the rampant HIV/AIDS in rural communities, where a man, as breadwinner, might migrate to the city to work and, as often happens, find pleasures with other women. Coming back as a ghost may allude to a point where there is little life left and one comes home to await death. This is emphasised by the fact that the scene is set in daylight, which is not usually associated with ghosts. Born Durban, 1978. Training Initially self-taught, and later came under the tutelage of Trevor Makhoba. Exhibitions 1997: Joint exhibition with Welcome Danca and Trevor Makhoba, African Art Centre, Durban. 2002: Solo exhibition, African Art Centre, Durban. 2004: Exhibition with Welcome Danca, African Art Centre, Durban. Collections The Killie Campbell Collections, University of KwaZulu-Natal, Durban; Durban Art Gallery; KwaZulu-Natal Museum Services, Pietermaritzburg. Photograph of Sibusiso Duma. Courtesy of Anthea Martin, African Art Centre Archives, Durban.